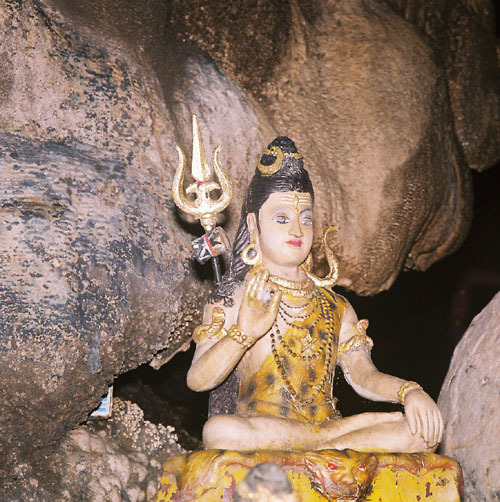 Guhesvara is a name of Siva, and means Lord of the Caves. Siva lived in a cave in the Himalayas on Mt Kailasa so his presence within a cave is a way to pay respects to Lord Shiva. This is the story of my visiting Wat Tham Boya in Nakhon Sawan, Thailand. 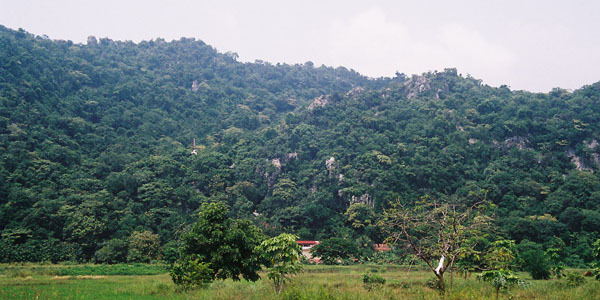 The cave is known as Boh Ya Cave and is located in Khao Luang Forest Park which has a large out cropping of lime stone hills, which are filled with many caverns. 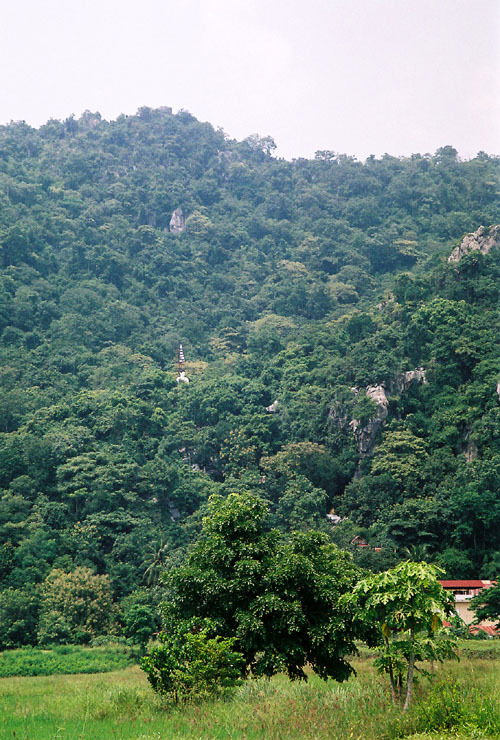 Wat Tham Boya sits at the base of one of these hills with a very long stair case which ascends up the steep hill and finally reaches the entrance to Boh Ya cave. 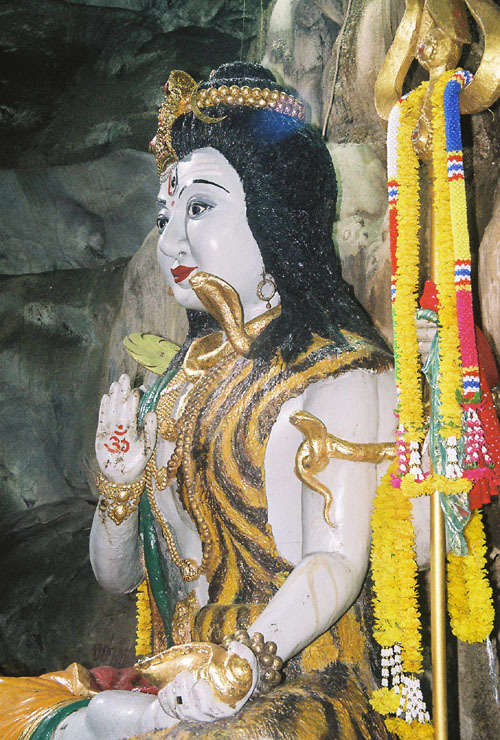 Having a statue of Shiva in a cave in Thailand testifies to the influence that India has had on the development of the spiritual evolution for the people of Thailand. In most cases most Thai people are not familiar with Shiva and associate him with the images of the Buddha. 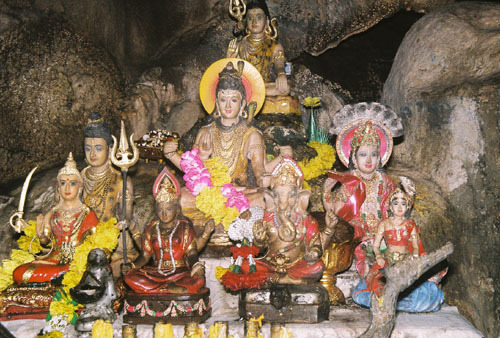 Nevertheless, inside Boh Ya cave you will find a wide assortment of deities from India. A.K. Ramanujan, (1929-1993) a scholar and translator of works in the South Indian languages Kannada and Tamil, translated into English the vacana poetry (free-verse lyrics) by four major saints of the great Bhakti protest movement which originated in southern India in the tenth century A.D. Allama Prabhu was one such realized poet-saint of this period who dedicated his poems to Shiva as Guhesvara or "the Lord of Caves." The story of how Allama came to dedicate his poems to Shiva , Lord of the Caves, was he excavated a buried temple looking for his deceased wife. The temple door was locked so he broke it down only to find a yogi in deep meditation. The yogi awakened from his trance and transferred a linga to Allama's hand which in turn brought Allama instant enlightenment and a devotee of Shiva. Allama's vacanas usually ended with the line, Lord of Caves. 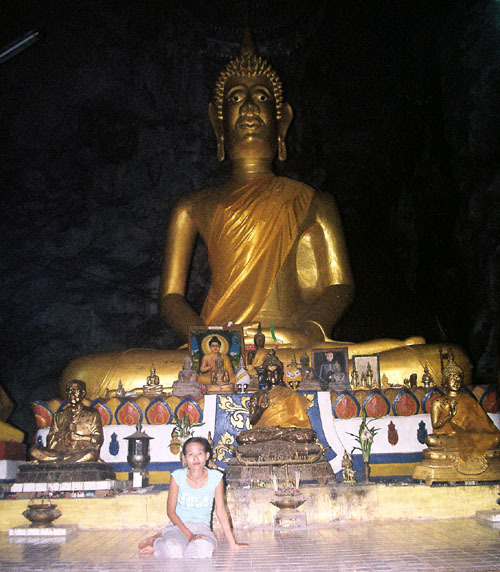 Before I begin my story, I will mention several of Allama's vacanas dedicated to Lord of Caves as an introduction to my own visit to see Shiva deep within the Boh Ya cave of Thailand. there can be no metaphor. After many months of reading "The Presence of Siva", by Stella Kramisch, I came to realize the history and the myth, which made Shiva the deity that he is. After visiting many temples dedicated to Shiva in both Laos and Cambodia, I took it upon myself to learn who Shiva was and why there had been so much energy expended to build these magnificent stone temples dedicated to Lord Shiva. Not having been born into a Hindu family, sensing Shiva the way a Hindu would experience this deity has to be very different than my own. It is my sense that an Indian born person, who is raised as a Hindu, and with Shiva as the favored deity, would give that Indian a deep devotional feeling nurtured by his or her own culture. But for me, being only a learned individual in understanding Shiva's place in the pantheon of gods, which comprises the Hindu faith, would not provide the same feelings. To live in India and to participate daily in rituals dedicated to the Hindu gods of Shiva, Vishnu and Brahma is something the rest of the worlds, outside of India, can only learn about. But I know in my deepest being that only by being in India could I truly feel the devotion that goes along with believing in Shiva. That said, I do believe Shiva is a very special manifestation of the universal energies that form this universe which are for me worth spending the time and effort to honor in the way a Hindu would honor this deity. It is a way to recognize a very ancient symbolic form (Shiva Linga) and the ascetic nature this deity instills in its worshipers. By going to the Boh Ya cave I was paying my respects to this deity who resides in a cave. 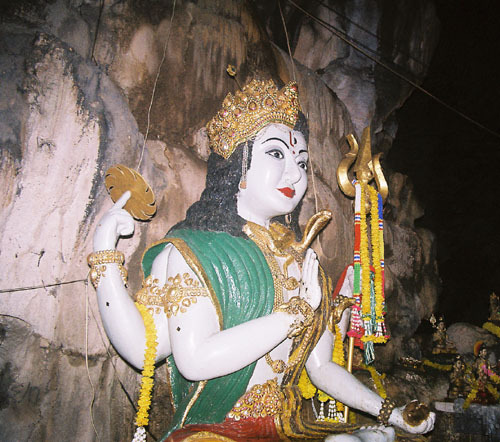 It was in this cave that I was able to feel, for a brief time, the sheer auspiciousness, which Shiva represents. From a simple question, asked in earnest, of who was Shiva, I transformed my way of thinking. The answer to the question at first appeared easy to understand. Shiva was one of three gods in the holy trinity of Vishnu, Brahma and Shiva: the trimurti. Shiva was the destroyer. He destroyed vanities, illusions, world ages, and universes. But he also bestowed boons and brought back a new world and a way to see the universe with out the veils of self contrived illusions. Shiva destroyed dualities. These were answers which would probably serve the majority of peoples needs in understanding Lord Shiva. However, when the same question is answered by Stella Kramisch an entirely different perception of Lord Shiva emerges. It is probably safe to say there is no other book quite like The Presence of Siva. Not because of the breadth and scope of knowledge, which the book certainly provides, but because woven simultaneously into the books informative narrative is a transcendental aura that surpasses logical understanding. The Presence of Siva is a divine distillation of the four Vedas held by Lord Brahma which contain all the knowledge of how the universe was created. These four volumes of the Vedas held in each of Brahma's four hands constitute humanities oldest writings concerning the origins of the human race on this planet. The central figure in the divine creation story is Shiva or Mahadeva. Siva has 108 names each containing an aspect of his projected Maya. Siva is the ultimate ascetic who lives in a cave. The cave represents the most inner plane of existence. When I went to Tham Lek cave at Vat Phu in Laos I could feel what it must have been like to be an ascetic in the fifth century when the beginnings of the Khmer empire were developing. Shiva was born of Brahma and is the one Lord who is responsible for all sentient beings which means everything and anything that lives. The discovery of small seals at two sites, Harappa in the Panjab and Mohenjo-Daro in Sind of the Indus Valley, depicting a figure in a meditative posture with crossed legs and clasped hands indicates that a deity like figure was being portrayed. Many scholars feel this was the beginnings of Siva worship which would date Siva at 3000B.C. if not earlier. The worshiping of Siva became the creative stimulus in constructing temples such as Angkor Wat, Phnom Rung, Vat Phu, Pimi, Sukothai, Phear Vihear, and many more throughout SE Asia. The influence of the ancient Khmers also reached the province of Nakhon Sawan in the town of Sri Thep. In early 6 century AD. the belief in Hinduism was widespread in this community. Vishnu and Krishna sculptures were discovered there. The encounter of sculptures is the indication of Hinduism influence which includes the belief in Siva-linga in the society. This belief was transmitted from ancient Khmer to Thailand through the northeastern route. 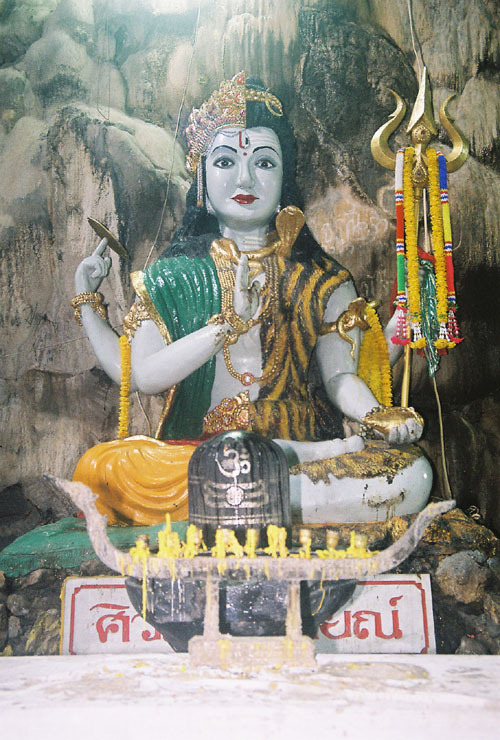 So it is not unusual that in this modern day to find Shiva still being worshiped as in the Boh Ya cave. Outside of the city of Nakhon Sawan on highway no.1 you travel about 17km to the Nong Ben Market. From here you take highway no.1072 for 5km on the way to Lat Yao until you reach the junction of the gate to the Sri Uthumporn Temple. 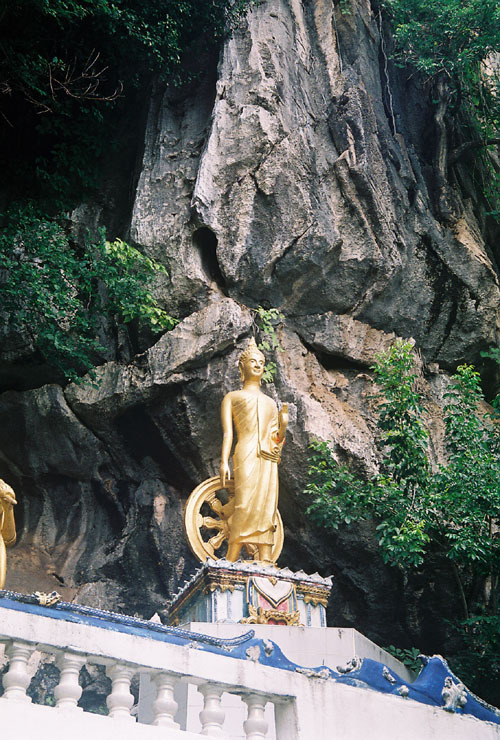 You take a left through the gate and go another 7km to the Khao Luang Forest Park where the Tham Boya Temple is located as well as Tum Boya Cave. 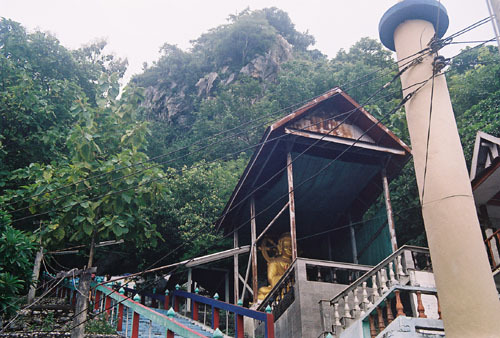 Once you reach Tham Boya temple you have to climb a very long stair case to the Boya Cave entrance. 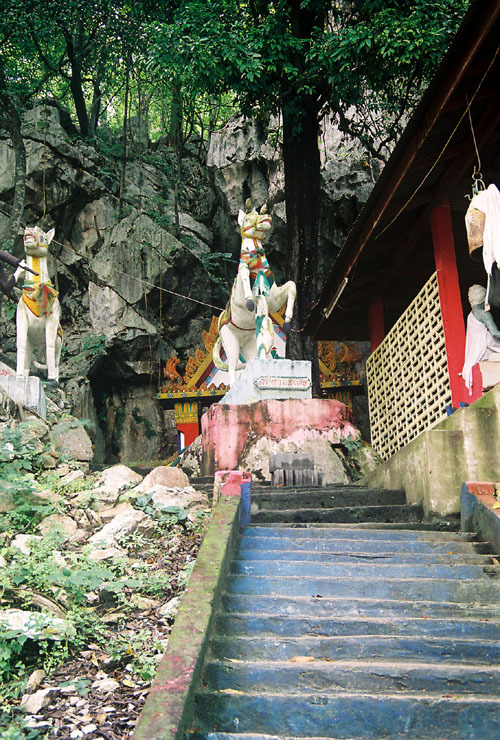 On the way up the steep stair case are images of the Buddha, and the last staircase which goes to the cave entrance is surmounted with a very large white horse. This is symbolic of the sacred horse that came out of the churning of the milky ocean myth as well as the horse that Siddhartha road out of his palace renouncing his court life as a prince to become Sakyamuni. When you walk up the stair case many Buddha images are either sitting in the lotus position in small shrine like rooms to make offerings or found standing on the rocky cliff overlooking the large gardens and fields at the base of the hills. The last stair case is the most magical as a great white horse sits on its hind legs at the top while the front legs are raised high greeting the ascending pilgrim. Directly behind the sacred horse is the entrance to the cave with a green iron gate which leads down a winding stair case into the interior of the cave. The cave is very dark except for a few florescent lights hung on the walls and the space inside is like a vaulted cathedral that winds endlessly throughout the inside of the hill. The heavy rains, which had been inundating the area, left the cave floor wet and glistening with the lights reflecting off the surface of the water. On this visit it was particularly quiet and very few people were in the cave. 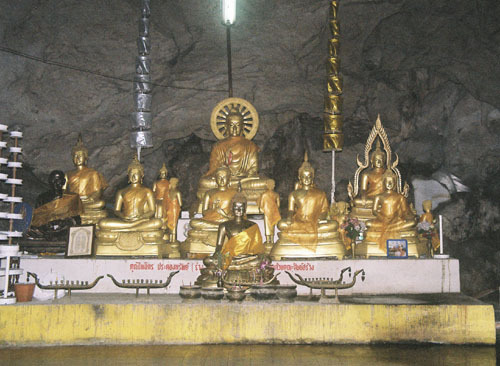 I had first visited this cave on January 29, 2004 with a tourism class I was teaching at Rajabhat University, and at that time had no idea of Shiva's importance as the Hindu God who lived within caves. However, after having visited Vat Phu in Champassak, Laos for three times, and subsequently learning more about Siva as the main deity of many of the Khmer temples in pre-Angkoren times, was when I began a serious quest for the origins and meaning of Lord Siva. As a result of understanding Siva, and as I mentioned, even having visited the cave Tham Lek at Vat Phu I was in full cognizance of why I was coming back to the Boh Ya cave. I wanted to see Siva in an entirely new light as the God who has been held in the highest devotional esteem for over 5,000 years. I came with a small carton of curdled milk to pour over the lingam as well as lighting an incense and bowing to pay my respects to Lord Shiva. I remembered doing the same on the top of Lingaparvata; the holy mountain dedicated Shiva at Vat Phu. It is difficult to express how I really felt as I bowed once again before Lord Shiva. I knew of the historical roots of Shiva, but the origins of my own faith was from a Christian nation, and only by going to the other side of the planet and feeling the devotion paid to Lord Buddha and the many Hindu gods was I slowly able to understand how much the faith in these gods was infused into every aspect of SE Asian culture and lifestyle. The many ancient stone temples in Thailand, Laos and Cambodia were left behind as reminders of the once great Khmer civilization. These stone temples were a testimony to the people's absolute devotion to Lord Shiva and Vishnu, and were filled with meanings. which reflected the grand design of the universe. But, standing in the Boh Ya cave this time was as if I had entered a very sacred inner sanctum of the most holy of holies. I was in Siva's home. Siva sits in the Boh Ya cave half in royal splendor and half in his ascetic garb with his elephant hide and blackened hair. Walking inside the Boh Ya cave gives you the feeling of leaving this world and enterning a subterranean mythical world. Everywhere you look in the cave the gods are assembled as if they knew you were going to arrive. There seems to be no end to the cave's long winding cavernous path winding its way into the interior of the hills. Countless small shrines are wedged into many of the small crevaces of the cave walls where there are deities enshrined in dull glowing lamps giving a very reverential feeling. It's possible to really disappear inside the cave and become part of the deep silence only a cave can offer. This interiorization is something Boh Ya cave exudes very dramatically. The musty smells and the towering Buddha in the central vault are powerful reminders of the belief in those values that reach beyond our overly secular world. A reaffirmation of those spiritual qualities that are so much apart of our being is enshrined in the middle of the the Boh Ya cave.